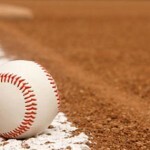 Ladavius Draine, the 6’4” Southern Miss shooting guard from Calhoun City, recently wrapped up his best basketball season. 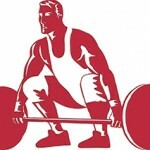 Jalen Armstrong and Mary Mason Langford of Calhoun City and Annie Kate Vanlandingham of Bruce won powerlifting state championships in their respective weight classes in Jackson last weekend. 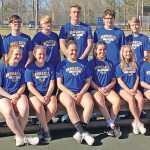 The 2019 Bruce High School Tennis team has begun their 2019 season. 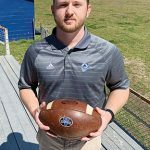 Brennan Pugh, 25, was officially named the new head football coach at Vardaman High School last week. 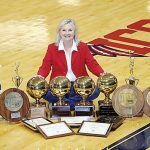 Itawamba Community College women’s basketball coach Nanci Gray announced her retirement from coaching in a press conference at the Davis Event Center last week. 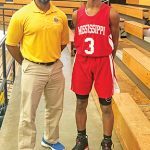 Quavon Marion of Bruce, pictured with his coach Yarnell Marks, and Jayvian Shaw of Calhoun City, both participated in the high school basketball all star game at Mississippi College last weekend. 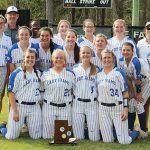 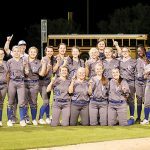 The Vardaman Lady Rams swept rivals Bruce and Calhoun City to win the annual county fastpitch tournament on the Lady Wildcats’ home field. 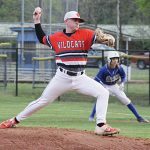 Look back at high school baseball action from around the county over the past week.